Because of some terrible traffic caused by an accident around my neighborhood, my plans to be in Lakewood tonight have gone awry. Will be there tomorrow to see Graham Stoneburner face off against the BlueClaws however. 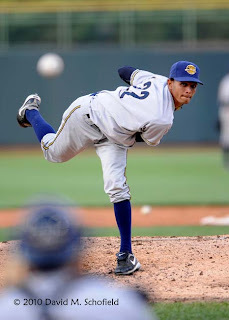 To make up for tonight, here's a pic of RiverDogs starter Kelvin Perez that was sent to me by team photographer David M. Schofield. I'm sorry, but that doesn't make up for it. Who wants to look at a blurry catcher? Blurry catcher? I think not.